We are so excited to announce the two winners from this month’s challenge!! You all KILLED it, and made it very difficult for us to choose!! But I think we managed to pick two incredible winners!! How adorable are these two projects? Seriously, these two ladies knocked the challenge right outta the park, and we fell in love!! Congrats, ladies!!! Please watch your inboxes for an email with more information about your prize!! There were SEVERAL projects that deserve an extra shout out, but we narrowed it down to three. Check it! Are we right, or are we right?!! Three incredible projects!! And NOW I’m sure you can see why we had such a hard time choosing!! Great job, ladies – you all blew us away!! Please be sure and drop by again tomorrow as we’ll have another super fun challenge for you! We can’t wait to see what you all come up with for this one!! Thanks so much for stopping by – have a great day!! Thanks so much! Made my day :) Congrats to everyone, the submissions were all great inspiration! Oh my goodness!!!! Thank you so much for the mention! Made my day that much better! Big hugs to you and the rest of the awesome mentions!!! Congrats to the winners, what fabulous cards! Love those holiday cards! Congrats winners!! Thanks for the shout out too. 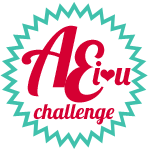 AEI♥U Challenge #28–Non-white Card Base!